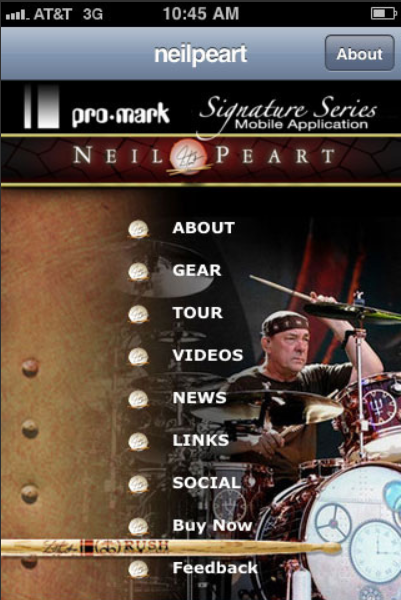 DrumChannel.com is offering a free lesson from Neil Peart's Frontiers of Composition and Articulation. I've watched the entire class when it was first released in June, 2009, and it's a great instructional video. Important note: It appears when purchasing a Master Class, you "subscribe" to the class for 12 months (you don't download the content). Dean and Ashley, the owners of Neil Peart's first Slingerland drum kit that was used on All the World's a Stage, 2112, Caress of Steel, and Fly by Night, have sent out their annual Chromey Christmas Card. I think all you drummers out there will appreciate the "Parts List" for this Christmas Tree. Feel free to leave a comment at the bottom of the card. Click the image to see the Christmas Card. Next year, Enter Music Publishing will celebrate its 20th anniversary. (Phil Hood, publisher and co-founder of Enter Music Publishing) noted that the company has already planned to conduct promotions and special events in conjunction with its anniversary. One of those is the launch of The Drummies Hall Of Fame. Eleven drummers who have won five or more Drummies will be inducted in January 2011. In addition, the company will be unveiling new digital products throughout the year. The documentary The Big Story of Small Potatoes: Niagara's Rock Music History 1964 - 1974 is now available on YouTube in 4 parts, as well as for purchase. Neil Peart was a part of this music scene, although he wasn't interviewed for the documentary. The director of the film, Paul Miil, told me via e-mail, last year "any Peart fan would enjoy this unique insight into the background of such an interesting and by all accounts 'great guy.'" 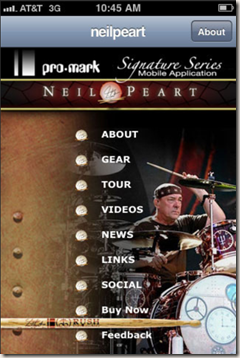 Pro-Mark's Neil Peart App is now available as a free download. Click the following link to see details. Many phones are supported. If your phone doesn't support the download (like my new Samsung Focus Windows Phone), you can look at the App as a website. There's a nice article in TribLocal about how the owners of Chromey, Neil Peart's first Slingerland kit, have been raising money for charity.